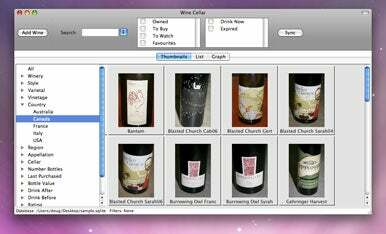 Users who turn to Cadent Computing's wineCellar to log and organize their wine collection will now be able sync entries via a new synchronization service added in the latest update. wineCellar 2.0 introduces Cadent Cloud, a service that lets the app sync up to 500 wines to a cloud where they can be viewed through either a standard Web site or a site for mobile devices. Cadent says that both of the Web sites use https, the secure sockets layer, to keep login credentials and data private. The mobile-enhanced site is accessible from any device which support https connections, which includes the iPhone, as well as other smartphones such as the Palm Pre. Ergonis Software released Typinator 3.5 on Thursday. The latest version of the text-expansion tool incorporates a new technology to speed up the program’s core functionality of text expansion and insertion as well as improve compatibility with third-party applications (the new technology requires Mac OS X 10.5.5 or later). Also included are support for custom user sounds, a workaround for a bug in Mail, and a number of other minor enhancements and bug fixes. , an update to the video import and cataloging program, was released by Riverfold Software on Tuesday. Version 1.1 adds much-requested support for uploading videos to popular sharing site YouTube, the ability to import videos from the iPhone 3GS, better tracking of moved or renamed video files, the ability to move the video library to an external drive, and a number of other minor enhancements and bug fixes. MacSpeech has released Dictate 1.5.2, a new version of its speech recognition software for the Mac. A maintenance release, version 1.5.2 fixes reported issues and adds support for Safari 4, the latest version of Apple's Web browser.